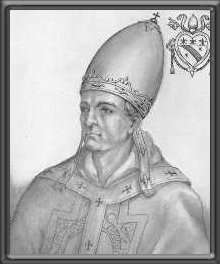 Pope Nicholas IV (Latin: Nicolaus IV; 30 September 1227 – 4 April 1292), born Girolamo Masci, Pope from 22 February 1288 to his death in 1292. He was the first Franciscan to be elected pope. Girolamo Masci was born on 30 September 1227 at Lisciano, near Ascoli Piceno. He was a pious, peace-loving friar whose goals as a Franciscan friar were to protect the Church, promote the crusades, and root out heresy. Heinrich of Rebdorf wrote that he was a Doctor of Theology. Originally a Franciscan friar, he had been elected Minister of Dalmatia in the Order's chapter at Pisa in 1272. Pope Gregory X (1271-1276), was sending a legate to the Greek Emperor, Michael Paleologus, in 1272, to invite the participation of Greek prelates in the Second Council of Lyons. The Pope's ambition was to achieve a reunion of Eastern and Western Christendom. Frater Bonaventure was invited to select four Franciscans to accompany the Legation as Nuncios. He chose Frater Girolamo Masci as one of the four. Masci succeeded Bonaventure as Minister General of the Order of Friars Minor (Franciscans) in 1274. Bonaventure had been attending the General Chapter of the Order, which began at Lyons on 20 May 1274, when suddenly, during the fifth session, he died. Frater Girolamo Masci was elected to succeed him, even though Masci was still on his embassy to Constantinople and was returning with the Greek delegates. The Greek embassy was presented to the Pope, Cardinals and Council on 4 July 1274. He was the associate of John of Vercellae, OP, sent by Pope Nicholas III (Giovanni Caetani Orsini) on 15 October 1277, to arrange a peace between Philip of France and Alfonso of Spain. He and John were again appointed to the same task on April 4, 1278. At the same time, Girolamo was ordered to continue as Minister General of the Franciscans until otherwise provided. Masci was made Cardinal Priest in 1278 by Pope Nicholas III, and assigned the titular church of Santa Pudenziana at some point after 16 May 1279. Even while a cardinal he was allowed to remain as Minister General of the Franciscans until the next general chapter. He was unable, however, to attend that General Chapter, since, as a letter of apology of Pope Nicholas III, written on May, 1279, indicates, Cardinal Girolamo was ill. On 12 April 1281 he was promoted Cardinal Bishop of Palestrina by Pope Martin IV. After the death of Pope Honorius IV on 3 April 1287, the Conclave was held in Rome, at the papal palace next to Santa Sabina on the Aventine Hill, where Pope Honorius had died. This was in accordance with the Constitution "Ubi Periculum" of Pope Gregory X. At the beginning, in April, there were thirteen cardinals in Rome; three Cardinals—Gerardo Bianchi, Giovanni Boccamati, and Jean Cholet—did not attend at all. The Sacred College was for a time hopelessly divided in its selection of a successor. When six of the electors died during the year 1287 (Ancher Pantaleon, Geoffrey de Bar, Hugh of Evesham, Giordano Orsini, Comes de Casanate, and Goffredo of Alatri—some, at least, carried off by fever), the others, with the sole exception of Girolamo, left the Conclave and returned to their homes. It was not until the following year that they reassembled. The electors at that time were seven in number: Latino Malabranca, Bentivenga de Bentivengis, Girolamo Masci, Bernard de Languissel, Matteo Rosso Orsini, Giacomo Colonna, and Benedetto Caetani. On 15 February 1288, the survivors unanimously elected Girolamo Masci, O.Min., to the papacy on the first scrutiny. It is said that the Cardinals were impressed by his steadfastness in remaining at the papal palace, but that is a superficial analysis, in the absence of any indication of what the Cardinals were thinking individually or collectively. As he admitted in his electoral manifesto, Cardinal Masci was extremely reluctant to accept, and indeed he persisted for an entire week. Finally, on 22 February, he gave in and agreed. He became the first Franciscan pope and chose the name Nicholas IV in remembrance of Nicholas III, who had made him a Cardinal. Given the considerable losses to the numbers of the Sacred College in 1286 and 1287, it is not surprising that Nicholas IV quickly proceeded to fill vacancies. What is surprising is that he did not even reach the number of cardinals who were alive under Honorius IV, let alone exceed it. On 16 May 1288, he named six new cardinals: Bernardus Calliensis, Bishop of Osimo (who died in 1291), Hugues Aiscelin (Seguin) de Billon, OP, of the diocese of Clermont in the Auvergne; Matthew of Aquasparta in Tuscany, Minister General of the Franciscans since 1287; Pietro Peregrosso of Milan, the Vice-Chancellor of the Holy Roman Church; Napoleone Orsini; and Pietro Colonna. Nicholas IV issued an important constitution on 18 July 1289, which granted to the cardinals one-half of all income accruing to the Holy See and a share in the financial management, thereby paving the way for that independence of the College of Cardinals which, in the following century, was to be of detriment to the papacy. In regard to the question of the Sicilian succession, as feudal suzerain of the kingdom, Nicholas annulled the treaty, concluded in 1288 through the mediation of Edward I of England, which confirmed James II of Aragon in the possession of the island of Sicily. This treaty had not properly seen to papal interests. In May 1289 he crowned King Charles II of Naples and Sicily after the latter had expressly recognized papal suzerainty, and in February 1291 concluded a treaty with Kings Alfonso III of Aragon and Philip IV of France looking toward the expulsion of James from Sicily. In 1288 Nicholas met with the Nestorian Christian Rabban Bar Sauma from China. The loss of Acre in 1291 stirred Nicholas IV to renewed enthusiasm for a crusade. He sent missionaries, among them the Franciscan John of Monte Corvino, to labour among the Bulgarians, Ethiopians, Mongols, Tatars and Chinese. Nicholas IV died in Rome on 4 April 1292, in the palace which he had built next to the Liberian Basilica (S. Maria Maggiore). He was buried in the Basilica di Santa Maria Maggiore. The 1291–92 Taxatio he initiated, which was a detailed valuation for ecclesiastical taxation of English and Welsh parish churches and prebends, remains an important source document for the mediaeval period. An edition was reprinted by the Record Commission in 1802 as Taxatio Ecclesiastica Angliae et Walliae Auctoritate. ↑ Hourihane, Colum (2012). The Grove Encyclopedia of Medieval Art and Architecture, Volume 2. OUP USA. p. 441. ISBN 978-0195395365. ↑ Kelly, J N D; Walsh, Michael (2010). A Dictionary of Popes. Oxford: OUP Oxford. p. 207. ISBN 978-0199295814. ↑ Marquardi Freheri, Rerum Germanicarum Scriptores editio tertia (curante Burcardo Gotthelffio Struvio) Tomus Primus (Argentorati: sumptibus Ioannis Reinholdi Dulsseckerii 1717), p. 605. ↑ Luca Wadding, Annales Minorum IV second edition (edited by J. M. Fonseca) (Rome 1732), p. 345. Their instructions, drawn up by Pope Gregory, are printed at pp. 353-355. ↑ Luca Wadding, Annales Minorum IV second edition (edited by J. M. Fonseca) (Rome 1732), p. 399 and 411. ↑ August Potthast, Regesta Pontificum Romanorum II (Berlin 1875), nos. 21165, 21294-21295; 21310; and see A. Theiner, Caesaris S.R.E. Card. Baronii Annales Ecclesiastici 22 (Bar-le-Duc 1870), under the year 1277, no. 47, p. 402. 1 2 3 Weber, Nicholas. "Pope Nicholas IV." The Catholic Encyclopedia. Vol. 11. New York: Robert Appleton Company, 1911. 29 Jan. 2015. Conrad Eubel, Hierarchia catholica medii aevi I, editio altera, (Monasterii 1913), pp. 10, 37, 46; and cf. p. 206. ↑ Sede Vacante and Conclave of 1287-1288 (Dr. J. P. Adams). ↑ Judicia Dei abyssus in A. Theiner, Caesaris S.R.E. Card. Baronii Annales Ecclesiastici 23 (Bar-le-Duc 1871), under the year 1288, § 5; p. 25; V. Langlois, Registres de Nicolas IV I, pp. 1-3 no. 1 (February 23, 1288). ↑ This is the story told by Heinrich of Rebdorf, in Marquardi Freheri, Rerum Germanicarum Scriptores editio tertia (curante Burcardo Gotthelffio Struvio) Tomus Primus (Argentorati: sumptibus Ioannis Reinholdi Dulsseckerii 1717), p. 605. ↑ Hugues Aiscelin was Master of the Sacred Palaces, appointed either by Martin IV or Honorius IV: J. Catalano, De magistro sacri palatii apostolici (Rome 1751), pp. 62-63. ↑ Conradus Eubel, Hierarchia catholica medii aevi I, editio altera (Monasterii 1913), p. 11. ↑ A. Theiner, Caesaris S.R.E. Card. Baronii Annales Ecclesiastici 23 (Bar-le-Duc 1870), under the year 1292, § 17, p. 123. Richard P. McBrien, Live of the Popes, 226. His sepulchral inscription is recorded by Vincenzo Forcella, Inscrizioni delle chiese di Roma XI (Roma 1877), p. 11, no. 6. Otto Schiff, Studien zur Geschichte Papst Nikolaus' IV. (Berlin 1897) (Historiswche Studien 5). Gustavo Parisciani, Nicolò IV, fra Girolamo Masci d' Ascoli, primo papa francescano. VII centenario del pontificato 1288-1292. (Ancona 1988). Antonio Franchi, Nicolaus papa IV 1288-1292 (Girolamo d'Ascoli) (Ascoli Piceno 1990). Giulia Barone, "Niccolo IV," Enciclopedia dei papi (Roma 2000) I, pp. 455–459.